Laura Grundmeier has worked as a Patterson office designer for 2.5 years and has designed hundreds of offices during that time. 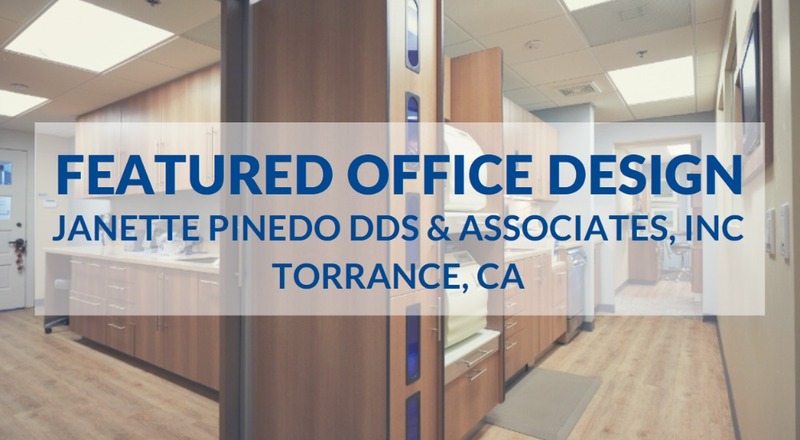 Of all of the office spaces she has worked on, Dr. Janette Pinedo’s Torrance, Calif., practice stands out the most. Pinedo came to Patterson requesting a new practice in a very specific location that she did not want to leave. The space proved challenging – structural columns split the office and a segmented layout made it difficult to create a sense of flow. Still, Laura and the rest of the Patterson team were up for the challenge and were dedicated to meeting the client’s needs. 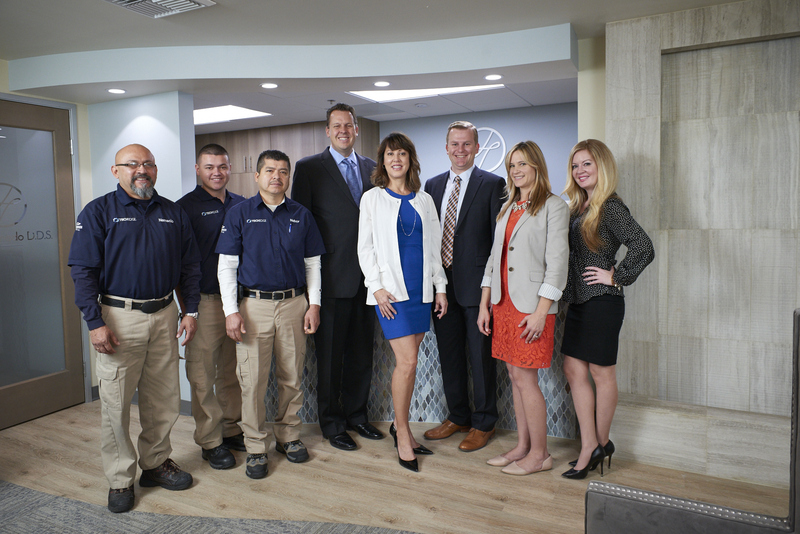 Dr. Pinedo (center) pictured with her Patterson team in the beautifully remodeled reception space of Pinedo’s Torrance, CA practice. Laura said that while working with the equipment specialist, the contractor, and the doctor, communication was key to overcoming design challenges and to completing the project. “Everyone had feedback along the way,” said Laura. “It wasn’t just one person’s design – it was really collaborative,” she added. For example, the equipment specialist provided vital information – including dimensions and structural elements that would affect design ­– for creating a space that met the doctor’s desired look and feel. Once designs were in place, 3D images provided by the Patterson team helped Pinedo to visualize the layout and get a feel for how it would flow before finalizing design plans. 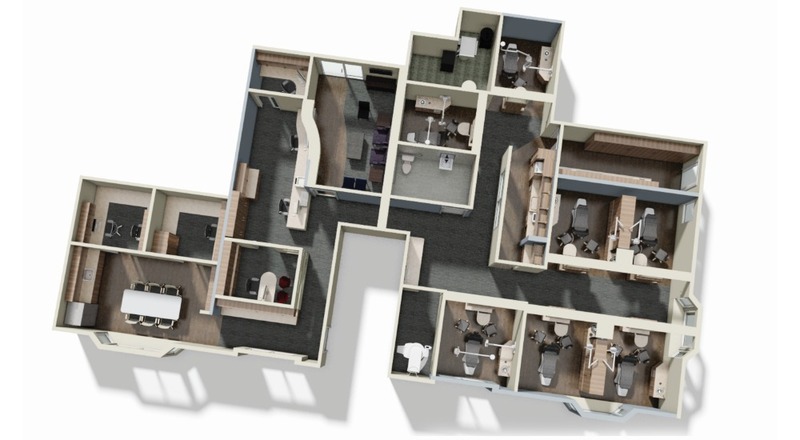 Patterson’s DesignEdge technology allows for the creation of detailed, animated, 3D renderings of what a redesigned office will look like. Here is a static image of Pinedo’s digital rendering. 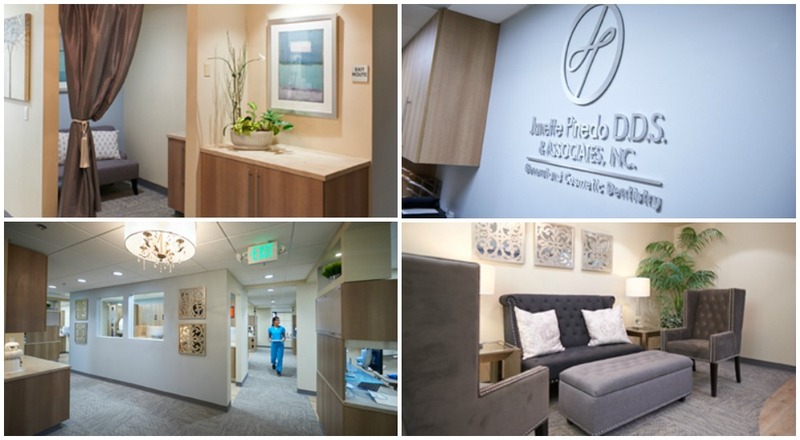 The project took several months to design, and the result is a modern space that meets the doctor’s goals including good flow, functionality, and seven treatment rooms in the 2,700-square-foot space. 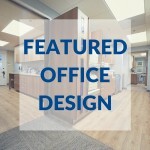 “It was very satisfying as a designer to see the end result and know the doctor is so pleased with it and that her patients are enjoying the experience they’re having in that office,” said Laura. A full gallery of interior photos from this completed project can be viewed on Patterson Today’s website – Click here to view! If you’d like even more details on this project, take a look at the video below which features an interview with Doctor Pinedo. A PDF version of the Patterson Today article featuring this project is also available to download for free HERE! Are you inspired by Laura Grundmeier’s beautiful work, and considering freshening up your own office’s look? THIS INFORMATIONAL PAGE on our website has all of the information you need to reach out to our design team and get started!